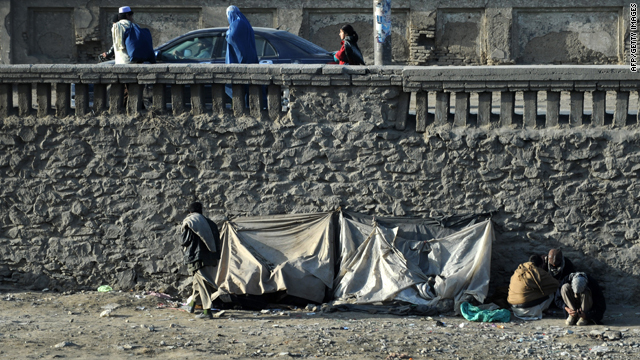 Afghan drug addicts sit in the sun at the Kabul River in Kabul on February 1, 2010. (CNN) -- Nearly one million Afghans between the ages of 15 and 64 are drug addicts, according to a new survey. That number would be about 8 percent of the population, or twice the global average, according to a report issued by the United Nations Office on Drugs and Crime. "Much has been said and written about Afghanistan as a leading producer of drugs, causing health havoc in the world," said Antonio Maria Costa, executive director of the UNODC. "It is time to recognize that the same tragedy is taking place in Afghanistan." Drug addiction appears to be on the rise as well. A previous survey, conducted in 2005, found that 150,000 Afghans were regular opium users and 50,000 were regular heroin users. Those numbers increased to 230,000 opium users and 120,000 heroin users in the new report. "We are facing a national tragedy," said Ibrahim Azghar, Afghanistan's deputy minister of counternarcotics. Afghanistan is the world's largest producer of opium, heroin and hashish, according to the UNODC. Cannabis, being three times cheaper to cultivate than opium, also is a popular crop. But among Afghans, opium use seems to be the most prevalent; about 60 percent of interviewed drug users reported using opium during their lifetime. Some have even given opium to their children. "This risks condemning the next generation of Afghans to a life of addiction," Costa said. There are 40 drug treatment centers in Afghanistan, but "treatment remains inaccessible to one-third of the country," said Robert Watkins, the U.N. secretary-general's deputy special representative for Afghanistan. There are centers in 21 of the country's 34 provinces. Of the drug users interviewed in the survey, 11 percent had received some kind of treatment. More than 90 percent said they needed treatment. "Three decades of war-related trauma, unlimited availability of cheap narcotics and limited access to treatment have created a major, and growing, addiction problem in Afghanistan," Costa said. Some observers have suggested that the answer might be counternarcotics -- getting rid of the poppy fields not only would help the Afghan people, it would cripple the Taliban by cutting off its funding. The illicit drug trade is a major source of revenue for the Taliban, which "taxes" Afghan farmers and traffickers to fund the insurgency. A report by the U.S. Senate, however, found that eliminating drug crops has a negative effect: It leaves farmers bitter and angry because they no longer have a source of income for their family. CNN's Chris Lawrence spent time with U.S. Marines in April, just a few hundred meters away from prospering poppy fields in southern Afghanistan's Helmand province. The Marines took a hands-off approach to the drugs, as they did not want to alienate the local village and push it even further toward the Taliban. "This is the only thing they know to produce quick money for themselves and for their families," 2nd Lt. Cody Hardenburgh said.